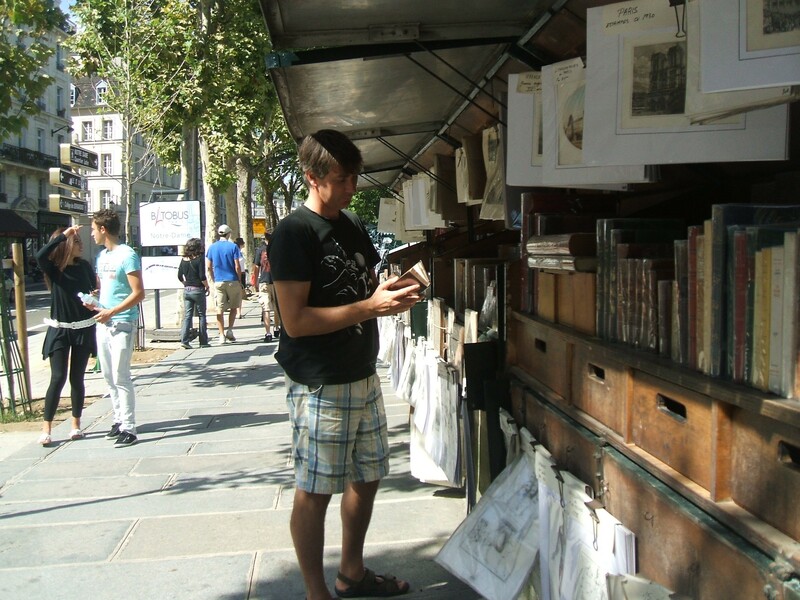 One of the nicest and most “Parisian” things to do in Paris is to have a browse through the book-stalls that are set up along certain quays in the heart of the city. 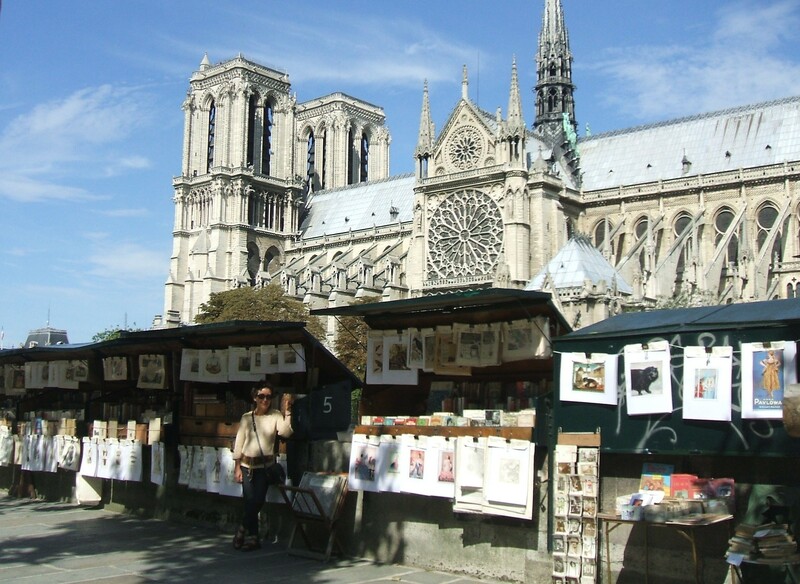 Since the beginning of the 17th century, the booksellers – or bouquinistes – have been a romantic cultural feature of the quays on and around the Île de la Cité; the central island in the River Seine, where the original settlement of Paris is said to have taken place and where the Cathedral of Notre Dame now stands. Initially, the authorities viewed them as a bit of a public nuisance. In 1649, and again in 1721, royal decrees were issued to have the Pont Neuf cleared of these booksellers. Over the centuries, a succession of regular attempts to eradicate this open market for which there was clearly a strong public appetite failed. In 1992, Unesco accorded the Booksellers of the Quays of Seine “World Cultural Heritage” status. 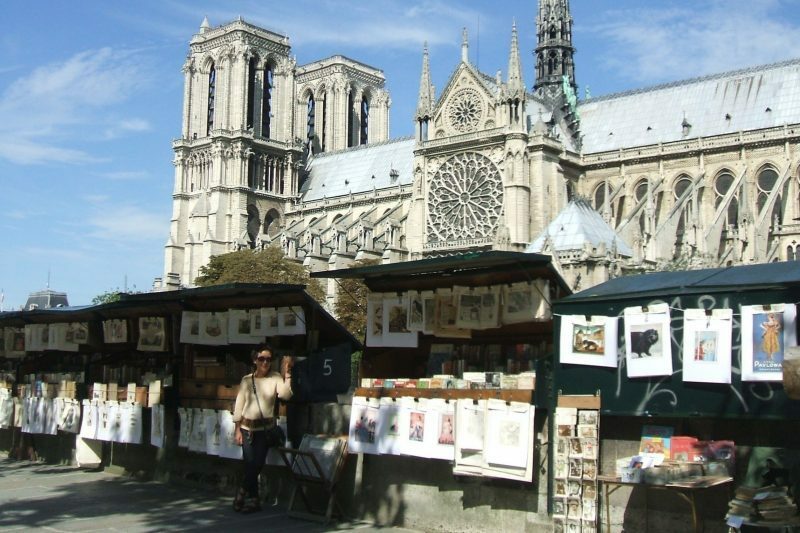 Today, there are 245 bouquinistes selling old and rare books and engravings from over 980 green boxes. There is no rental charge for the spaces but stall-holders must conform to the regulations once they have been approved following application and assessment. The main regulations dictate the standard size and colour of the stall, that the stall is open to the public at least four days a week and that it sells items on the approved list: namely old books, second-hand books, old papers, antique etchings, books that have been awarded the prix des bouquinistes and merchandise illustrating the quays and which are sold exclusively by the bouquinistes. New books published by independent publishers can also be included. In addition, one box can be devoted to selling souvenirs, but items should be of “artistic value” and all items should be respectful of public taste. In an era of electronic books and factory-sized bookstores, speculating on the end of the era of the bouquinistes has become something of a national sport in the French media. Reports in the press and television find evidence of decay in abandoned stalls or traders who reveal some shockingly low statistics (one recent article in L’Express quoted an anonymous bookseller who said that he sold just four books at €10 each per week). Many of the traders I spoke to had been interviewed by the French media and many were reluctant to talk any more – even to a foreign journalist. Many reports in the press have been painting the trade in a very negative light, with talk of a major crisis affecting the booksellers in a world where money has suddenly become scarce and where people’s appetite for literature seems to have vanished in favour of digitalised sound bytes. The day I browsed the stalls was a sunny autumn afternoon, with almost all the stalls open and most appearing to conduct a healthy trade on the crowded quays. Laurence’s stall consists mostly of old rare books, carefully displayed and protected from the elements by individual plastic wrapping. Generally speaking, she says, her books cover a range ending with the 1950s. She also sells a number of old prints and etchings and there’s a marked absence of trinkets and souvenirs. Laurence was born into a book-trading milieu; her father was also a bouquiniste who sold books at the market before taking a stall by the Seine and Laurence herself has been writing 19th-century crime novels for several years with her sister Liliane under the nom de plume Claude Izner. Down the street on Quai de Montebello is Alain Méhul. Also in his fifties, his stall on the corner of the Pont au Double consists mostly of engravings and prints, with little space given to books. He also feels that there appear to be changes afoot now which are indicative of some sort of cultural crisis as well as a recession but, like Laurence, he has seen many changes over the decades he’s been working his stall. “With everything, there’s a fashion,” he says. “There was a time, for example, when any books or images relating to Jules Verne sold like hot cakes and that suddenly stopped. It was the same thing with black-and-white photographs. She cites novelist Colette as one who was always requested but for whom demand has disappeared in the last four years and the area of science fiction as an entire genre that has fallen in demand almost to the point of complete disappearance. When Alain first started out, his stall sold only books, but has gradually evolved into selling almost exclusively images. He prefers to work intensively for eight months of the year – every day without a break – and then paint for the remaining four months. He began drawing at the age of 14 and studied art at the École Nationale Supérieure des Beaux Arts (College of Fine Arts). He specialises in selling etchings that he makes himself and is, he says, the only one doing it. 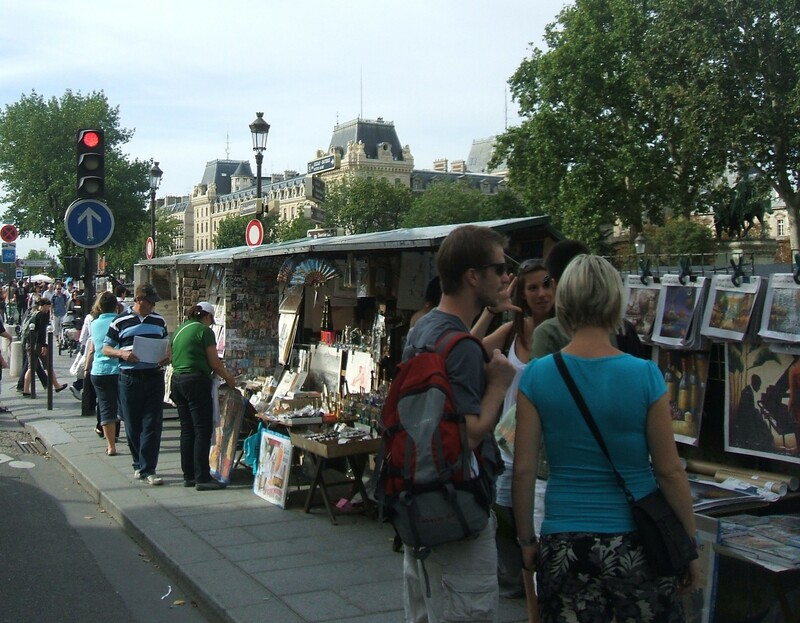 Qualifications for the trade of bouquiniste don’t exist on any official level. If you want to get a place along the quays, you must go through a series of procedures involving filling in an application form from the mayor’s office and providing a cv and letter of motivation. Apart from that, what does it take to be a bouquiniste? Another possible element to the decline in business being felt by the bouquinistes is the worldwide decline in people speaking French. 50 years ago, French was on a par with English as an important global language of communication, but today it’s the language of Shakespeare which has taken precedence. And what of the future for the bouquinistes? Alain says that you need to be a bit “special” to do this work, stroking his beard with an ironic smile on his face. I ask him if, after almost three decades standing outside, he’s getting tired of it.